There are lots of decisions to be made when you are thinking about a new kitchen, and the finish of your cabinets is important from a functional as well as a design perspective. 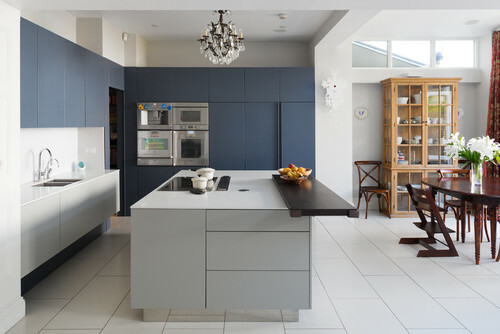 This guide to choosing the right finish for your kitchen cabinets from the Houzz website will explain what’s available, the advantages and disadvantages of each, as well as some tips to ensure that the look of each finish will work best in your new kitchen. What is a high-gloss finish? High gloss is by far the most requested finish among my clients, and it seems as popular now as it was when it was last trending in the 1970s. 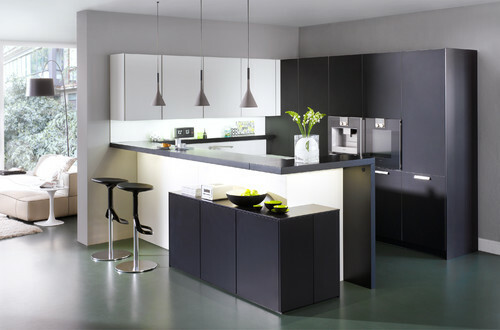 It is more suited to a contemporary-style kitchen with flat cabinet fronts than it is for a traditional-style kitchen. High-gloss finish may also be referred to as ultra high gloss or 100 per cent gloss, depending on the materials you are using and the supplier you speak to. 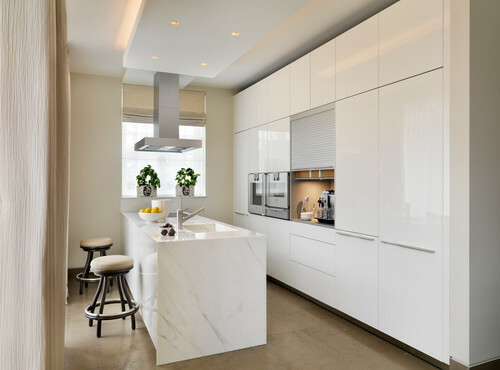 High-gloss cabinet doors have a shiny finish that reflects light, which is one of the main reasons that gloss kitchens, especially white gloss kitchens, are so popular. 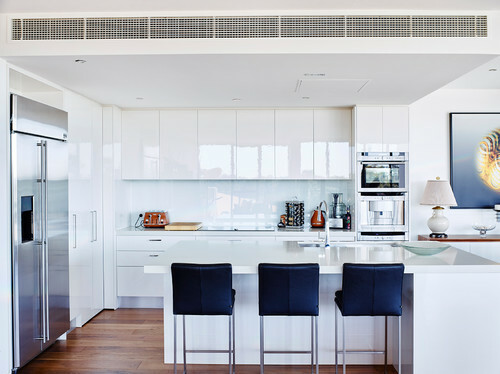 By reflecting light, the shiny finish of these gloss cabinet fronts helps to make the space feel bigger and more open than it actually is, making gloss-finish cabinets an excellent choice for smaller kitchen spaces. This light reflection is also a bonus if you are considering a darker colour, as you won’t need to worry about the shade absorbing the light out of your room. The paler the colour, the higher the reflection of light, which is why white is the most popular colour for gloss kitchens. However, bear in mind that this reflective quality will also bounce light around and reflect other colours within the room on to those surfaces.Colour cast can slightly alter the appearance of the colour of your cabinets. 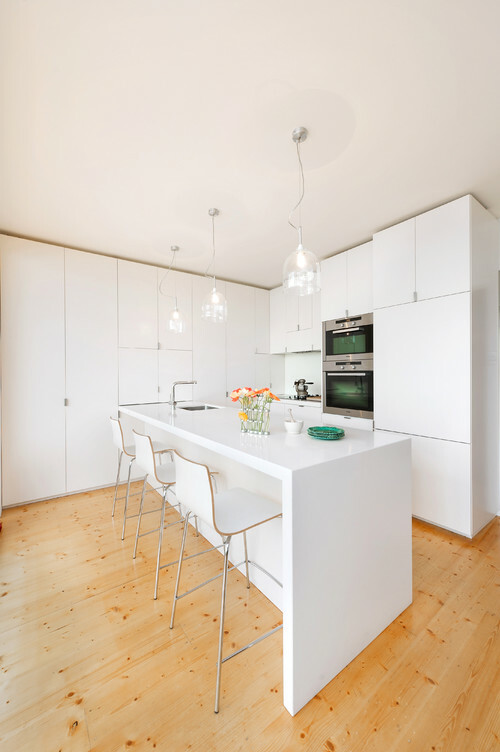 So if you have lots of other colours in the kitchen or in a nearby living area, don’t be surprised if those colours are reflected on the gloss kitchen cabinet door surfaces, especially if they are white. Another great advantage of high-gloss cabinets is that they are really easy to clean, which is always a winner for homeowners with a young family. Use a non-scratch microfibre cloth to clean the cabinet fronts as they will easily pick up any dust particles sitting on the surface of the doors. The disadvantage of a dark colour in a gloss finish is that any tiny imperfections on the surface of the doors, such as scratches or finger marks, are much more noticeable than they are on lighter colour gloss doors. You might want to steer clear of darker colours if you have young children or are concerned about having to clean the cabinet fronts more regularly than you would like. Reflections of light on gloss cabinets are much more apparent on higher cabinets than they are below kitchen benchtops because they are more at eye level. If you would love some high-gloss cabinets in your kitchen, but are concerned about seeing fingerprints, consider choosing a high-gloss finish on your upper cabinets, and use either a matt or a semi-gloss finish for the lower cabinets. Likewise, if you would love to incorporate a darker colour into your kitchen and really have your heart set on a gloss finish, then consider mixing it with a lighter colour. Position the darker colour cabinets at eye level where they are out of reach of sticky fingers (especially if you have children), and keep the lower-level cabinets a lighter colour, which won’t show finger prints as easily. What is a matt finish? Matt finish cabinets don’t reflect any light at all and look more flat than a gloss finish does. Matt finish is the perfect choice for more traditional-style or country-style kitchen cabinets that have routed fronts – gloss is too shiny and modern-looking for these styles of kitchens. A matt finish also looks just as good on contemporary-style flat cabinet fronts as it does on more traditional-style fronts, and appears to be growing in popularity. In fact, in Europe, matt finish cabinet fronts are now more popular than gloss. The main advantage of matt-finish cabinet fronts is the fact that fingerprints, scratches and other imperfections are far less noticeable than on gloss-finish fronts. This doesn’t mean that there are no fingerprints or marks that show, it just means that you don’t see them as much due to the lack of light reflecting on the surface. The colour of matt-finish cabinets can look more consistent than gloss ones. This is because there is no reflection of light to make some areas of the cabinet fronts look brighter or darker than others. Notice how the colours in the kitchen pictured here look far more consistent than those in the red and black gloss kitchen above. A surface with a matt finish absorbs light as opposed to reflecting it. This results in a more muted look. You should also note that, because matt-finish cabinet fronts don’t reflect any light, they won’t help to make your space feel any bigger, if that’s what you are trying to achieve. Matt finish cabinet fronts are not quite as easy to clean as gloss cabinets are, because the matt surface isn’t as smooth. Even so, they are not difficult to clean. Again, use a microfibre cloth, which won’t ever scratch your cabinets. If you are choosing a laminate material for your cabinet fronts, ensure that you check out samples carefully and that the material preferably has a smooth flat finish. Some matt-finish laminates have a texture to them, and this makes them slightly more difficult to clean as a textured finish will give dirt and dust more surface to stick to – but it shouldn’t stop you buying textured laminates as they can look spectacular in the kitchen. Ideally, choose a sparely textured surface with a low-profile. If you love the appearance of matt-finish cabinets, but are concerned that the whole look might be a bit too flat and boring, then consider two ideas. The first is to select a door that has a simple routed profile in it, such as the shaker-style kitchen pictured here. The profile will cast different shadows on the cabinet fronts creating a feeling of depth and interest. The second idea is to mix two different colours together to create a contrast and a point of interest. If you are still not convinced as to whether you should opt for a gloss or matt finish for your new kitchen cabinets, then maybe a semi-gloss finish might be the best option for you. Semi-gloss cabinets combine some of the advantages from both gloss and matt finish cabinets. They have a degree of light-reflective qualities so light will be bounced around the kitchen. However, because a semi-gloss surface is not as highly reflective as a high-gloss surface, you won’t see as many reflections in your cabinet fronts, and this may give you a more consistent-looking colour. Additionally, you’re less likely to notice fingerprints as easily on high-gloss fronts. A semi-gloss finish is also just as easy to wipe clean as a gloss finish.